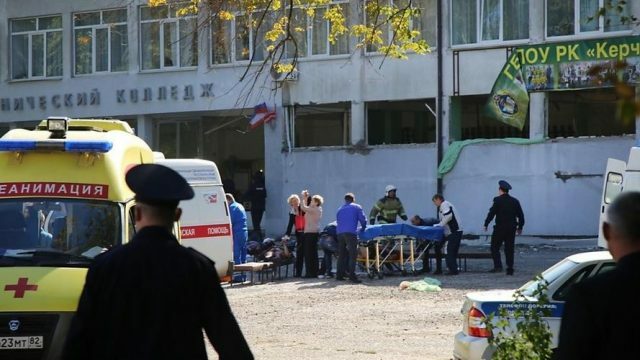 A mass shooting followed by an explosion at a secondary school in the Crimean city of Kerch has killed at least 19 people and injured more than 50, including the lone attacker, according to local Russian officials. In the chaos and confusion of the immediate aftermath — which included the Russian military arriving on the scene — there were wildly conflicting reports of either a gas leak explosion or a terror attack underway by a group of armed men; however, investigators have now described the event as a mass shooting by an 18-year-old student, who took his own life after shooting scores of others. And it’s now emerging that the shooter may have been obsessed with the Columbine Massacre school shooters who took the lives of 13 people in 1999 in a suburb of Boulder, Colorado. Russia’s investigative committee has named the suspect as Vladislav Roslyakov and said he was 18, rather than 22 as first reported. It added the incident was now considered a multiple homicide rather than a terrorist attack. Social media images first published by Mash showing what purports to be the shooter, Vladislav Roslyakov, walking through the school are being compared to Columbine High School shooter Eric Harris — who in 1999 killed 13 and wounded over 20 more alongside Dylan Klebold in Boulder, Colorado. Wednesday’s Crimean school shooter, Vladislav Roslyakov, is depicted to the far right. Left is 1999 Colombine massacre shooter Eric Harris. Crimean shooter Rolyakov was apparently imitating Eric Harris with his white shirt and shotgun as shown in the unconfirmed social media photos of Wednesday’s attack. Looks like the Crimea shooter wasn’t politically motivated but more of a Dylan Klebold type as I said earlier. He was apparently a “Columbiner”—people obsessed with and sometimes sympathetic to the Columbine school massacre. Russia’s official Investigative Committee had previously referenced a “terror attack” after an on the ground investigation that uncovered evidence of an improvised explosive device packed with shrapnel which had been reportedly detonated in the cafeteria of the tech college (in Russia a “college” indicates a secondary school, or high school). Though officials initially said an “unidentified explosive device” detonated, they now say all the victims died of gunshot wounds. A number witnesses accounts appearing described a gruesome scene “bodies everywhere” – most of them students: “There was a blast and then the shooting…we started jumping out of the windows… children’s bodies were lying all over the place,” one student recalled of the horror. Early unconfirmed reports cited eyewitnesses who said the attack began when masked armed men entered campus and burst into classrooms wielding assault rifles; however, authorities now say it was a lone gunman and have described a school shooting scenario which though uncommon in Eastern Europe, has become tragically commonplace in American domestic headlines. Only one man responsible for the shooting was found, but in the panic and confusion of the moment, people believed they saw more than one killer. Investigators haven’t ruled out there may be more. Online, witnesses accounts and gruesome details were beginning to appear on social media. “There was a blast and then the shooting…we started jumping out of the windows… children’s bodies were lying all over the place,” one student recalled of the horror. Armored troop transport vehicles and Russian military personnel were quickly on the scene as reports of a “terror attack” in progress had spread. “Five minutes after I left, some people burst in. They blew up the lobby, all the windows were shattered…. Like in Beslan! I would have been dead by now because they shot dead all my people, children and the staff… I don’t know,” the college director told local media. Beslan is a reference to the worse terror attack in Russian history — the Beslan Masaccre — which involved a 3-day siege of a school North Ossetian region by armed Islamic militants in 2004, resulting in over 300 dead after planted explosives were detonated. Video soon emerged in Russian media showing confused students attempting to interpret what they were hearing and seeing, including smoke and gunshots across the campus. As the attack in Crimea is now being classified as a mass school shooting by a lone attacker who was a student at the school, the more approximate comparison is that Crimea just had its own tragic Columbine-style massacre. Sickeningly it appears the shooter planned to imitate Columbine precisely.